September 2015 issue on sale now! | What Hi-Fi? September 2015 issue on sale now! If you're in the market for a new pair of in-ear headphones, we'd humbly suggest you need to read our all-encompassing headphone buying guide. First things first, we get down to the business of how to choose the right pair. In-ear, on-ear, over-ear - we run through the benefits and key things to consider before buying. As well as advising you on which type of headphones are right for you, we will of course give you a steer on which models to check out. We've reviewed a selection of the best on the market for around £50, with headphones from Beyerdynamic, Klipsch and Sennheiser. The £500 home cinema amplifier section of the market is about as competitive as it gets in the AV world, so this is a biggie. Three of the key players line-up for home cinema supremacy. Now is a fine time to pick-up a big-screen TV for a knockdown price. We review the big-name brands (and a smaller fish) to find out where you should be spending your money. Four fixes for the vinyl junkies, but which one will have you in a spin? We put these £300ish turntables through their paces to find out. As always we have a bumper First Tests section, an Insider feature on the Ultra HD landscape, two new Temptations, the famous What Hi-Fi? Buying Guide... and even a test of mains blocks. Don't say we don't treat you. 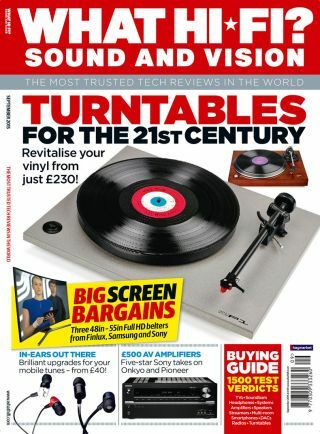 The September issue of What Hi-Fi? is on sale now - and don't forget, you can download the digital edition of the magazine directly to your smartphone or tablet.